At some point the other day I peeled the sticker off the center of the cooling fan on my Printrbot extruder. I think in so doing I must have budged the solder where the wires enter the fan: last night I realized the fan wasn’t running, regardless of setting. So, this morning I pulled my multimeter out of cold storage (no, really – it is cold in the garage) and verified current was reaching the fan. I was happy to confirm the fan was at fault, and not some connection on the circuit board. A quick trip to Unicorn Electronics for an identical replacement, and we’re back in action! 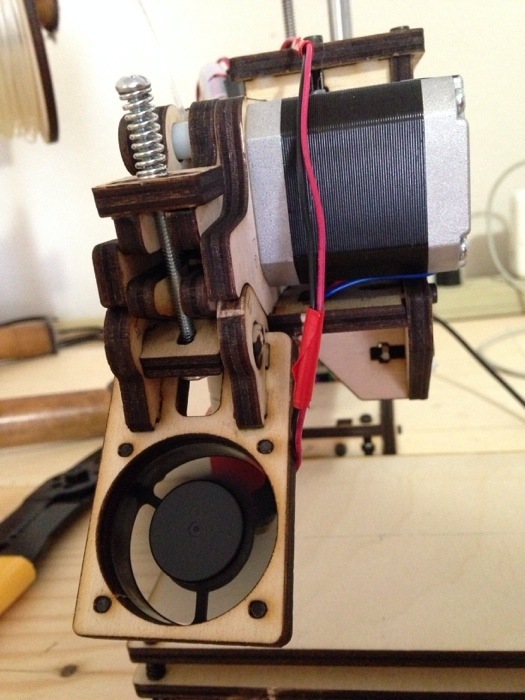 The cooling fan helps ensure plastic emerging from the extruder solidifies quickly. Actually, as a test I printed several items earlier this week with it turned off, and didn’t notice a difference in output – perhaps it is more important when the ambient temperature is higher.